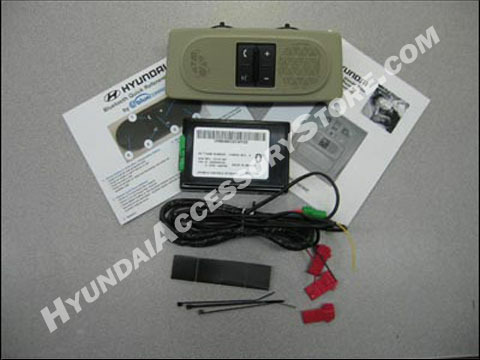 The Hyundai Bluetooth kit is the new state-of-the-art integrated, hands free cell phone system for your vehicle. This system utilizes Bluetooth wireless technology in a hands free profiled cell phone and eliminates the need to hold a handheld cell phone, wear a headset, earpiece, or use an in-vehicle mounted handset adapter while making or receiving phone calls. BlueConnect is easy to use, hands free, and voice activated. This handsfree device allows drivers to keep both eyes on the road & both hands on the wheel. Users must have a cell phone that supports the Bluetooth "hands-free profile". It is the user's responsibility to ensure that his or her phone is compatible with this system. Your Bluetooth profiled cell phone must be paired or electronically matched to the bluetooth unit. Then simply place your cell phone anywhere in the passenger compartment of your vehicle. Your Bluetooth handsfree profiled cell phone will automatically connect or transmit to the unit every time it is on, charged, or within range (30ft). Wiring is required. Professional installation is recommended. This unit replaces the sunglass holder. I have had my 2011 Hyundai Elantra Touring since new and used the Blueconnect with my Motorola flip phone. I have since purchased 2 different phones. An LG and a ZTE neither of which are compatible. I find this to be unacceptable in this day and age. All phones with Bluetooth should be compatible. I don't know if the newer Hyundai's have the same problem but I will be looking into it before I purchase a new vehicle.